It's so hard to say goodbye to yesterday. It's also hard to get a good group singing photo. The former is, of course, a reference to Boyz II Men. My cousin got me a couple of tickets to see their show at the Flamingo. I didn't expect to be so into it. 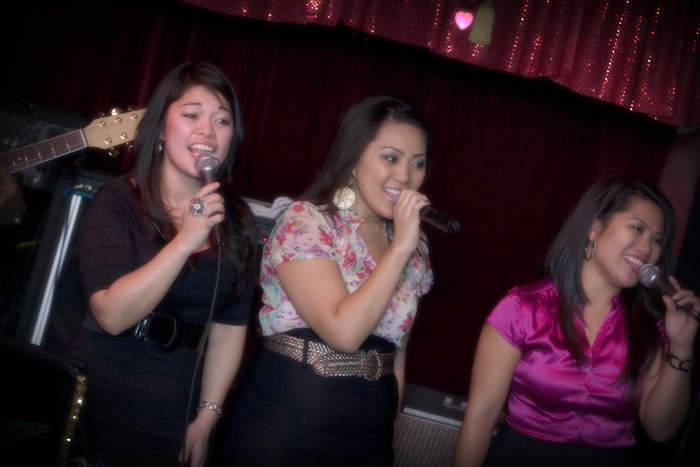 Afterward, I caught up with said cousin and her sisters to watch them sing Christmas songs at a local Thai restaurant. The thing about photographing them - it's difficult to catch a shot where they all look great. Invariably, there's usually at least one of them with a weird facial expression. Incidentally, the Thai restaurant (Krung Thai on Flamingo and Decatur) has this Crab Fried Rice that is absolutely incredible.